A quick Google search for a newborn photographer in Salt Lake City may leave you feeling frustrated and confused. You may be wondering why there is such a huge range of pricing between photographers. You may wonder if all of the professional products are really worth the extra investment. You may be nervous about an uncomfortable sales presentation. I hear you and i've got your back! After being in business for over 10 years and dealing with hundreds of clients, I know what clients value in a photography session. 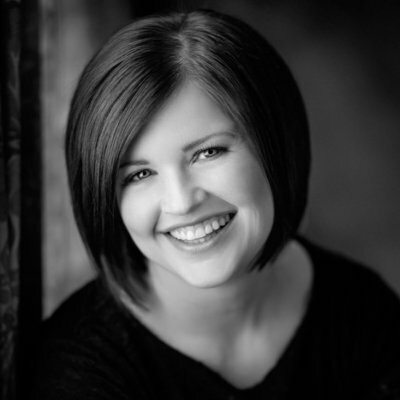 Sessions at Heather Pickett Photography are structured to give you exactly what you want! Working with a true professional means you will have a thorough and thoughtful experience from start to finish. Training and credentials should be up to date and on point. Client communication should be polished and respectable. Technical aspects of photography should be nailed every time. Retouching should be careful and artistic. The safety of your newborn should never be in question. That's the kind of professional you'll get with Heather Pickett Photography. 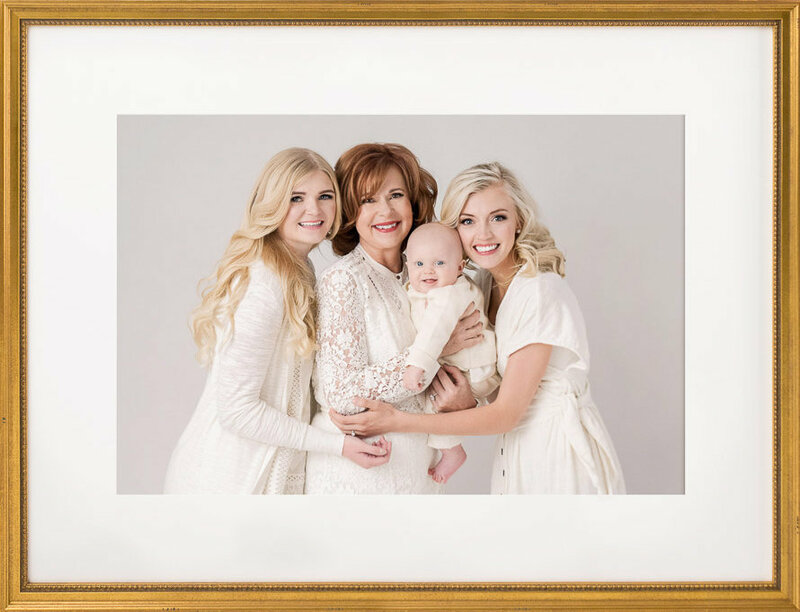 Is printing your portraits important? Absolutely! Do you get a significantly higher quality products by printing through a professional photographer? Hands down! Is wanting the digital images a faux pas? No way! As a consumer of photography myself, I understand the value of having the digital files for my personal use. The digital files are absolutely available for purchase. I've combined the best of the print and digital worlds by including the digital files with the purchase of an album. Talk about a win-win! I know you will be so excited to see your portraits from our session together. I only take a few clients every month so that I can provide you with amazing customer service and quick turn around times. Your hand-edited digital images will be ready for viewing only one week after our session - that's more reliable than the next episode of This Is Us! Let's just say that not all photographic products are created equally. I have scoured the industry and spent thousands of dollars researching which world-class, professional-level products I want to offer in my studio. I have incredibly high expectations and you can be sure that products ordered through the studio will be of the highest available quality. The best part is that you don't have to pay overly marked-up pricing. I offer these products at special rates because I want you to know what it is like to truly own a piece of artwork. You'll be hooked! What woman, especially a pregnant woman, doesn't want things specifically tailored to simplify her life in some way? I will walk you through the process and make things as easy as possible. At the same time, I want to know how it will work best for you as an individual with specific and individual needs. Do you want your Design Consultation done in-person, over the phone, or in an e-mailed questionnaire? We will do what works best for you. I want you to feel heard, valued, and appreciated in the process. Let's work together to make your session an enjoyable and memorable experience! Most Popular - Save $250! The profits from each session, including Petite Sessions, are used to provide Wishful Heart sessions to mothers in our community who are suffering from an aching heart. Because these sessions do not involve parents or other family members, they are typically scheduled during the week. Weekend sessions are reserved for Full and Inclusive Sessions. 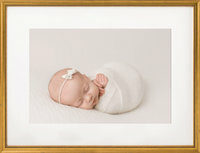 The Petite Session features the details and simplicity of your newborn. We will keep your newborn diapered and wrapped in various decorative wraps and blankets to maximize the variety of images for your gallery. If you follow the preparation tips in the welcome guide, an hour will be plenty of time to capture your newborn in various props and wraps. Please do your best to be on time - we only have an hour! All of our best tips & tricks for preparing for your newborn session are included in your digital welcome guide. You will also find a full price list for our professional line of products available. You get to choose! Would you rather do the design consultation in-person at the studio, over the phone, or with an e-mail questionnaire? Let me know what is most convenient for you! Perfect for those who want high quality, professional portraits of their newborn at a budget-friendly price . One week after your session you will be presented with 10-15 edited images at your Artwork Design Session or online gallery. Once again, you get to choose what works best for you! See product pricing. The profits from each session, including Full Sessions, are used to provide Wishful Heart sessions to mothers in our community who are suffering from an aching heart. Weekend sessions are specifically reserved for Full and Inclusive Sessions. We do everything we can do to accommodate the busy schedule of other family members, so please let us know what works best for you! We will have time during the session to capture the newborn on their own and with other family members. We will aim to capture a variety of wrapped and naked poses of your newborn, based on your preferences and the comfort and cooperation of your newborn. Some babies are really sleepy and the session can progress quickly. Other times, they need a little more time to settle into the process. We allow for plenty of time to follow the temperament of the newborn, making sure to leave time for comforting and feeding as necessary. We've made getting ready for your newborn photo session a breeze with our collection of products included in the Newborn Welcome Kit. It also includes a trifold packet of information and tips on how to prepare for your session as well as a full pricing menu. Perfect for those who want to include additional family members during the newborn session or who want a greater variety of images of just the newborn. One week after your session you will be presented with 30-35 edited images at your Artwork Design Session or online gallery. Once again, you get to choose what works best for you! See product pricing. Perfect for those who know they want the digital collection and are wanting to save by paying up front. The most popular option! One week after your session you will receive 30-35 edited images at your Artwork Design Session or online gallery. Once again, you get to choose what works best for you! Booking the Inclusive Session saves you $250 because you are pre-purchasing the entire digital gallery. The albums and other products are available at special, VIP pricing so you save even more! I know it may feel like a significant investment. I promise you it will be worth every penny. The details of your newborn fade so quickly and, speaking from experience, it will be a time in your life you'll wish to have back - at least in small doses. Let's work together to capture these details and feelings in beautiful, artistic ways that you can enjoy forever. In the meantime, hand your husband a paper sack for some deep breathing, and let's get you on the calendar. You've looked through the sessions and decided which will work best for you. Now the real fun can begin - designing your products! There is nothing more timeless than cherishing your newborn as a piece of art.